With this Limited Edition Tag-Heuer Silverstone Automatic Chronograph timepiece on your wrist, the only thing that will be blue about you will be your watch. Your friends, however, just might turn green with envy (especially when they learn that yours is 1 of only 1,500). And if that isn’t already impressive enough, you can tell them that this stunning fine-brushed stainless steel timepiece got its name from the Silverstone Racetrack in England—home of the British Grand Prix. Like a high performance automobile racing the circuit, the highly sought after Swiss-made Silverstone Automatic Chronograph draws a lot of attention. It’s no wonder that its unique, sophisticated aesthetic was inspired by the Monaco watch worn by “The King of Cool” Steve McQueen in his legendary film Le Mans. True to the original Silverstone from 1974, this piece has a distinctive, retro-cool—yet distinctly modern–square case with rounded edges and Chronomatic Calibre 11 functionality. 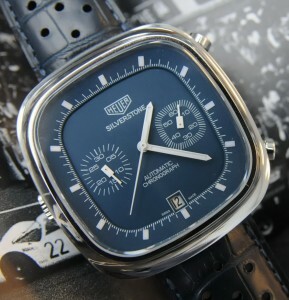 It also has a Heuer-branded crown and stunning blue dial with silver accents, white luminescent markers and two sub dials for seconds and minutes, at 3 o’ clock and 9 o’ clock respectively. The date window arrives at 6 o’ clock sharp.